This is a level 6-7 adventure set in the World of Uteria. The players have to bargain to gain entry to the Town of Aerville and fetch a couple of artifacts from a nearby catacomb in order to appease the mayor. The tomb is that of Kochun, a once powerful warlord, who in his aging dementia created a fortress out of his final resting place to keep grave robbers and looters at bay. Traps, monsters, and more await inside the Tomb of Kochun! The Tomb of Kochun is a 40 page full color RPG adventure with all the stats that you need to run the game. It features artwork by Michael Bielaczyc, Grant Cooley, and Sam Flegal. 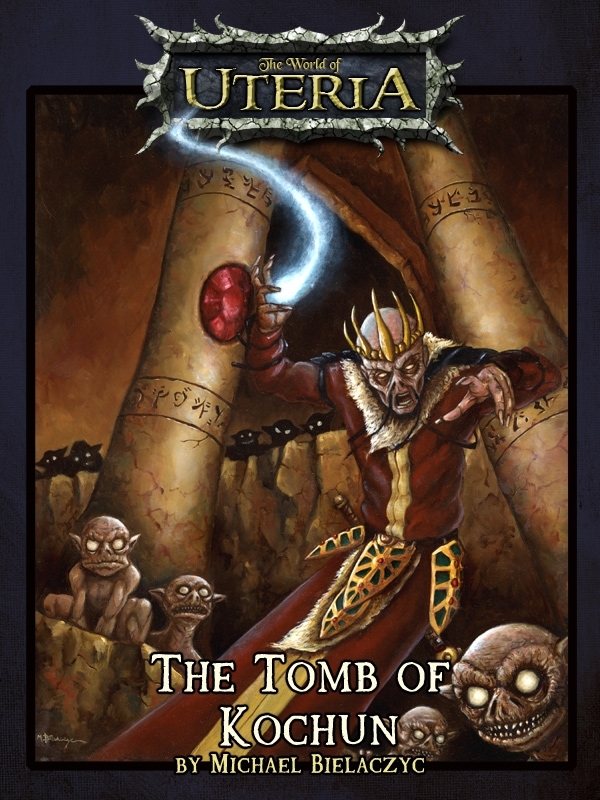 This adventure is based in the dark fantasy world of Uteria, though it can easily be converted into any standard campaign setting. It features a full dungeon crawl with traps, tricks, and monsters to challenge a level 6-7 party. The book comes with 4 pre-generated characters, so jumping right in is simple. There are two NPC’s included that can provide the party with a rogue or cleric, with a story-driven reason for them to accompany the players.